Part No. LIQ-705CL-B In Stock Fedex orders placed now will ship on April 22nd. Koolance 705 series coolant is used by many industries requiring a low conductivity (3 microSiemens per centimeter), low-toxicity, reliable coolant with corrosion and biological inhibitors. A high quality coolant is extremely important for addressing dissimilar metals and biologic growth (bacterial and algae) long-term. Koolance liquids will not clog components and can typically be used for 2-3 years before replacement is recommended. 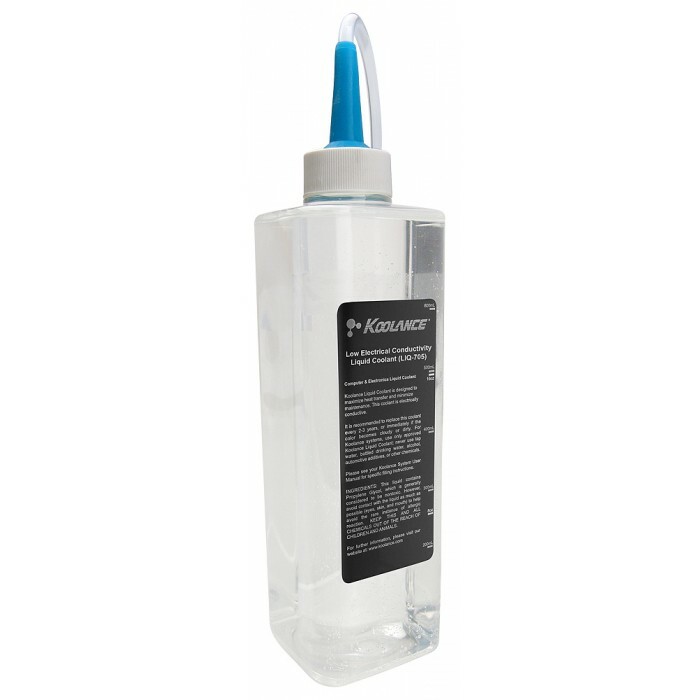 This container includes 700ml (24 fl oz) of prediluted coolant and can function as a squirt bottle for convenient reservoir filling. It's recommended to replace the coolant every 2-3 years, or immediately if there is any change in color or clarity. Liquid coolant mixtures based primarily on water will conduct some amount of electricity. Keep in mind that foreign debris (such as dust) will increase the conductivity of water-based coolants.